The maps of actual precipitation that I used in the "How Did the Forecast Work Out?" posting below came from the NOAA/National Weather Service and used actual measurements of precipitation combined with radar, the latter to fill in gaps between weather reporting stations. When I was filing away the information, I saw an opportunity to explain an issue with the current radar network. 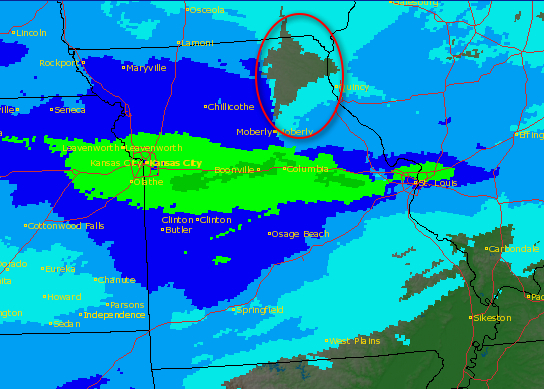 Map of moisture from recent storm. Circled area is radar gap. Click to enlarge image. In Warnings: The True Story of How Science Tamed the Weather I called the current radar network one of the best investments (in terms of value for the number of dollars spent) the federal government has ever made. I heartily stand by that assertion. However, the radar network is not perfect. There are gaps and one of the worst is in northeast Missouri. The surrounding radars in Kansas City, St. Louis, Springfield (IL), and Quad Cities are too far apart to give quality coverage to northeast Missouri. The biggest problem is known as the "radar horizon" -- the fact that the radar's beam is relatively straight while the earth curves out from under it. or snow, two types of weather that occur in the lower atmosphere. 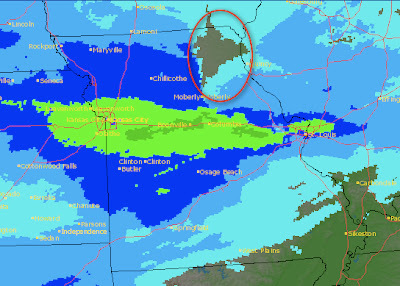 Even though we know it snowed significantly in northeast Missouri (the Kirksville weather station reported it), there is no snow reported over Kirksville on the map of Missouri precipitation. The radar overshot it and the computer algorithm was not able to correct the problem. While this is an annoyance with snow, it is a real problem with tornadoes and downbursts. Both of those occur in the lower atmosphere and can be overshot by the surrounding radars. There are a number of proposals (see here for one of them) that have been bouncing around for a half dozen or so years to fix this problem. And, as federal programs go, the fix for this and about ten other gaps would be quite inexpensive. I suggest that we are at a point where it is time to stop studying these options and start fixing the problem.